Until recently I knew nothing about geocaching. I had heard the term, but really didn’t know much about it. However when I decided to create this website, I started hearing more and more about this fun activity. It is a hobby that goes hand in hand with hiking and biking. According to the geocaching.com website “geocaching is a treasure hunting game where you use a GPS to hide and seek containers with other participants in the activity.” There are over 100 countries that have caches and the lower Sunshine Coast is home to at least 250 and the upper Sunshine Coast has another 217 or so! You’ve probably passed more than one on your hike or bike ride. Here is a map that has the locations of all the caches on the lower Sunshine Coast. If you put your mouse over each icon it will tell you the name of it. You can also click on the icon and a little information window will pop up. If you have a free account on geocaching.com you can also click on the cache name and get even more information, including the coordinates, photos and more. Recently I went looking for the cache called Homesite and even with the coordinates I went away without finding it. These are not easy to find, but it is fun looking! I’m pretty sure I’ll find it next time. A typical cache is a small waterproof container containing a logbook where the geocacher enters the date they found it and signs it with their code name. Larger containers such as plastic storage containers (Tupperware or similar) can also contain items for trading, usually toys or trinkets of little value. Geocaching is a fun hobby for all ages and all abilities. 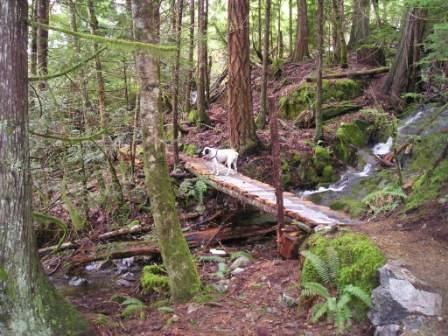 There are many levels of difficulty from park and grab caches to ones that require mountain climbing or scuba diving. 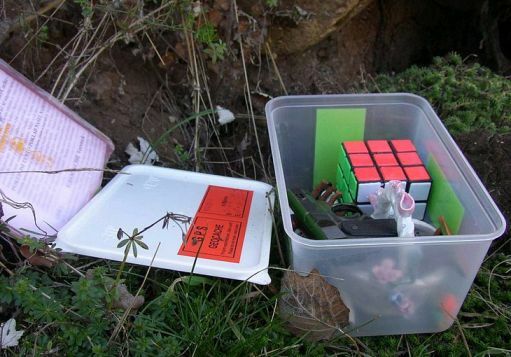 Some geocaches contain “trackables” – an item that contains a unique code that allows it to be tracked as it travels around the real world. Some trackable items have traveled thousands of miles. With all the talk lately about nature deficit disorder (a way to describe the costs of human alienation from nature, particularly for children in their vulnerable developing years), geocaching is a fun way to connect people both young and old with nature. If you want more information about this fun hobby check out the Geocaching.com website. You can create an account for free and start logging your finds now. The Geocaching.com logo is property of Groundspeak, used with permission. Click here to return to the Sunshine Coast Home page.